In addition to its many natural gifts, Ethiopia benefits from its location, close to the markets of Europe and the Middle East, and possesses good freight links to all major and emerging markets including Western Europe, the Middle and Far East, Russia and the USA. Currently, Ethiopian floriculture is mainly exported to the Netherlands (80.3 percent), but exports extend to France, Germany, Italy, Canada, Norway, Belgium, Sweden, UK, UAE, Saudi Arabia, Japan, USA and other EU countries. Fruits and vegetables have traditionally been exported by road to neighboring countries, Somalia (56.8 percent), Djibouti and the Sudan, but increasing quantities are now also being shipped by air to the Netherlands, the UAE, the United Kingdom, Germany, Belgium, Russia and Yemen. The new fast track electric-powered railway line connecting Addis Ababa to Djibouti, other railway lines under construction and improvements to the internal highway roads will also open up opportunities for road or rail transport of production to the coast, and then sea freight to a range of market destinations. With the aim of accelerating the transformation of the horticulture industry, the Ethiopian government established new horticultural hubs at four geographical locations: Alagae, Arbaminch, Bahir Dar and Hawassa, which are conducive for investment. 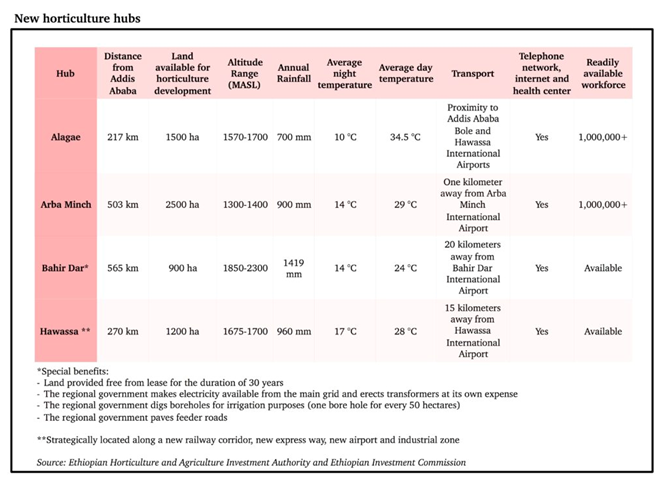 The four horticulture hubs identified have several competitive advantages (see table below). Investors in horticulture have zero tax privilege on exports. They are exempted from income tax for 8-10 years and from duties and other taxes on imports of machinery, construction materials, spare parts, raw materials and vehicles and provided with a one-stop government services and essential infrastructure. They have access to finance with loan facilities (up to 70 percent of the total investment) from the Development Bank of Ethiopia, with 30 days of loan approval and readily allocated finance. They benefit from aboundant land and water, with over 6,000 hectares of available land, 30 years of zero charge land lease, 15 days of handover period and abundance of ground and surface water. In terms of logistics, the national carrier, Ethiopian airlines, flies to over 120 destinations worldwide both on freighters and belly hold, with state-of-the art cooling facilities specialized in handling horticulture products. People who invest in horticulture in Ethiopia have to respect corporate social responsibility, Integrated Pest Management, code of practice and provide employment to local people. Corporate social responsibility (CSR) is the farm’s sense of responsibility towards the community and environment (both ecological and social) in which they operate. It includes support of medical care via construction of farm clinics or hospital, support for education by providing training to the staff, support for construction of local schools, provision of water in rural areas, affordable meals for employees and rehabilitation. Most farms fund these activities from their farm revenue and some farms are also certified by Fair Trade labels. Ethiopian Horticulture Producers and Exporters Association (EHPEA) closely works with the members of the association, the government and other stakeholders. The EHPEA code of practice introduced in 2007 has been revised and upgraded on several occasions to reflect the increasing requirements of the market and the need to maintain continuous improvement on the farms. The Code contains requirements for Good Agricultural Practices, Protection for the Environment, Employment Conditions and Staff Safety and Welfare. The benchmarking Version is 4.0 of the Code with Global GAP and the Global Social Compliance Program with a view to achieving full market recognition for the standard and reducing the audit burden on farms supplying multiple clients in the international market. EHPEA is committed to standards and employs a Team of Trainers to provide training, advice and support for farms to meet Code and other Market Label standards. In addition to contributing to the overall economic development of the country, the horticultural export industry has created job opportunities for about 183,000 people, 70 percent of whom are women. This is an important contribution to local economy, to the empowerment of women in the community and to household food security. In a nutshell, looking into the untapped and lucrative opportunities and incentive packages given to the industry, foreign direct investors and the Ethiopian diaspora are invited to invest in Ethiopia in the sector in general, and in the four identified new horticulture hubs in particular, to enjoy the benefits of this growing industry.